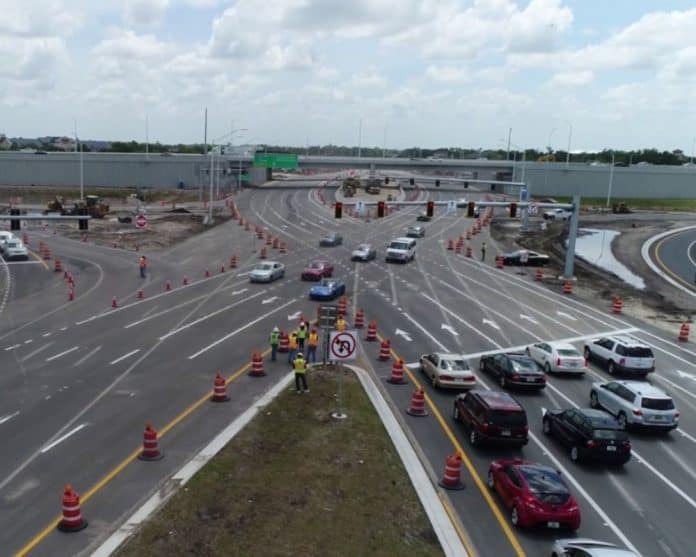 The Florida Department of Transportation’s I-75 at University Parkway, Diverging Diamond Interchange (DDI) project was recognized this week by a consortium of national transportation organizations as one of 12 finalists in the “America’s Transportation Awards” competition. The online voting that began this week will now determine the national Grand Prize and the People’s Choice Awards and a cash prize state departments of transportation can use for educational scholarships or non-profits in their home states. Sponsored by AASHTO, Socrata, AAA, and the U.S. Chamber of Commerce, the America’s Transportation Awards was created in 2008 to recognize the very best projects state departments of transportation deliver to their communities each year. The I-75 at University Parkway DDI in Southwest Florida is the first of its kind in Florida and the largest in the nation. At a cost of $74.5 million, it features a “dual crossover” design to improve traffic flow and reduce congestion by employing fewer conflict points than a traditional cloverleaf interchange. “We are excited and honored to hear that the I-75/University Parkway DDI project has been selected as a finalist in the AASHTO awards,” said District One Secretary L.K. Nandam said on Thursday. “FDOT is very proud that this innovative solution has had such a positive impact on this incredibly busy interchange. The Department will continue to use this and other innovative designs to accommodate Florida’s continued growth. “Online voting begins today, Aug. 30, and continues through 11:59 p.m. eastern time on Saturday, Sept. 22. To cast your vote, click here. Individuals can vote once a day,” Nandam added.